As we age it becomes more important than at any other time in our lives to stay fit, healthy and active! Just because the advancement of age has slowed you down doesn't mean you must stop or worse yet quit! 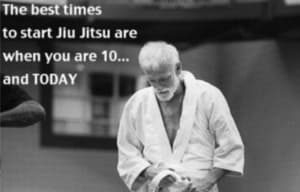 Gracie Jiu-Jitsu at The Martial Arts Zone can be just what the Doctor ordered. It is important to approach Gracie Jiu-Jitsu training with a sensible and intelligent plan. This means respecting the fact that you have aged and that you are NOT the same as you where 25 years ago! But over 40 gives you many advantages which youth overlooks, wisdom! Listen to your body and train for longevity. Remember life is a marathon NOT a sprint. Gracie Jiu-Jitsu at The Martial Arts Zone in Manchester, NH. Check it out today!